The military coup in Honduras puts pressure on the president to break sharply with past American policies or risk losing remains of Latin America's goodwill. 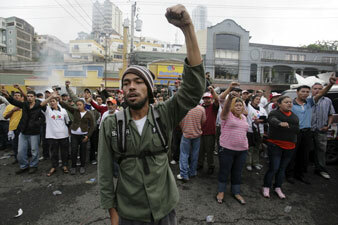 Supporters of Honduras’s President Zelaya sing the national anthem outside the presidential house in Tegucigalpa. The military coup against Honduran president Manuel Zelaya puts pressure on President Obama to break sharply with past American policies or risk massive defections in what remains of Latin America’s goodwill. Yesterday President Obama declared the coup was “not legal” and affirmed the Zelaya government’s legitimacy, statements that were considered “very good” by Venezuelan diplomats interviewed by The Nation. The Obama position is complicated by the history of US training of the Honduras armed forces, past involvement with shadowy death squads, and concern over Zelaya’s alliance with the Bolivarian Alternative for the Americas. In the background are memories of US complicity in the attempted coup against Venezuela’s Hugo Chávez in 2002. The issue will become paramount today as foreign ministers of the Organization of American States (OAS) meet in Washington, DC, to consider their response. The Venezuelans will be accompanied by the exiled Honduran foreign minister. Meanwhile, Zelaya is expected to be at the United Nations for meetings at the General Assembly. “This will be a turning point in the history of the OAS,” observed the Venezuelan official. The choice for Obama is whether to side with a democratically elected government that happens to be a Venezuelan ally, or be ostracized by the governments of Latin America. Obama’s policies have indicated a desire for modest and gradual rapprochement after the Bush years, without rapid or concrete changes. That gradualism will be tested today.